Sewta 2010 Conversion Finally Completed!!! Finally, after some paint here and there and much hand-wringing about the length of time to get a simple conversion painted, she is painted. I've been looking at her on the painting table for months now giving me a disapproving look. I finally had to urn her around so she couldn't see me. 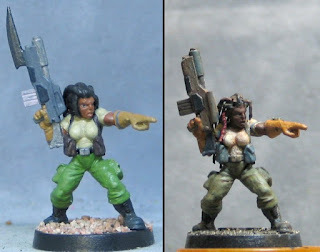 But now she's done and looks good and is ready for whatever sci-fi skirmishing is available. Where the updates left off there was no mention of the scope or her control pad on the left glove. 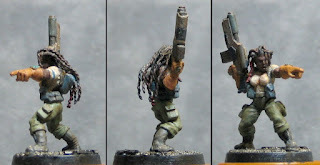 The scope was a simple length of thick plastic wire that I came across and started adding to several of the old Void minis' rifles as targeters or scopes. I wanted to jazz up her gloves and I found an old plastic bit from GW with a row of buttons. I gently sliced the buttons off in a strip and simply glued it to her glove. I love the look of the Infinity miniatures that have the clear VR screen bits, that's the sort of controller these buttons are meant to be. SO now that this one's done I need to the Ananka conversion update. Hopefully that one won't take 2 years!